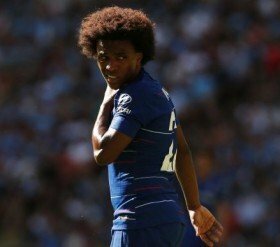 Spanish champions Barcelona are reportedly prepared to make a fresh approach for Willian after witnessing their initial player-plus-cash offer rebuffed by Chelsea. Earlier on Thursday, the Blaugrana are said to have offered Malcom plus £50m to sign the Brazil international but the attempt went in vain with the Blues wanting more in terms of the transfer fees. This has, however, not deterred the La Liga holders from their pursuit and Evening Standard claims that they are prepared to lodge a fresh bid for the experienced winger. Willian has struggled to replicate the form from the backend of the previous campaign and he has managed just two goals and two assists in the Premier League this term. The attacker has previously indicated that he is committed to the Blues' cause but the west Londoners have yet to offer him a contract extension beyond the summer of 2021. Willian is likely to feature from the off on Saturday evening where Chelsea are scheduled to entertain Rafael Benitez's Newcastle United in the Premier League.